Cairns, Queensland's northern-most city, is an international gateway to Australia and the Great Barrier Reef. 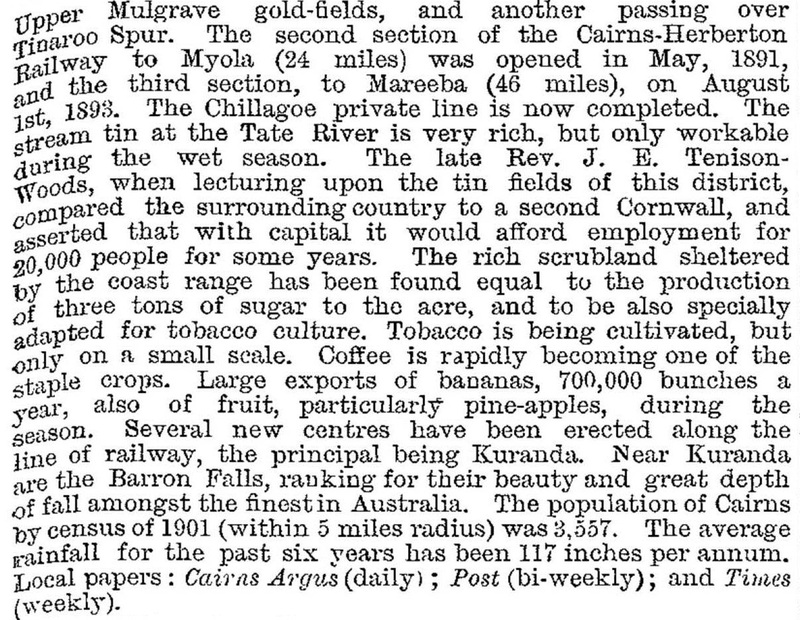 For much of the twentieth century, its economy depended on sugar growing and farming on the nearby Atherton Tableland. Later tourism became the dominant industry. It has long been engaged in commercial rivalry with the larger city of Townsville. The city looks east to the Coral Sea at Trinity Bay, which was named by James Cook in 1770; 103 years later the area was explored by George Dalrymple, who considered it suitable for settlement. He was impressed by Trinity Inlet – a wide river opening fed by several watercourses – which he thought would make a good harbour. The proximity of these finds to Cairns, and the surveying of workable tracks over the range to Cairns harbour, eliminated Port Douglas as a rival. The Cairns local government division was also proclaimed (1879). Melbourne interests, represented by Thomas Swallow, propelled an infant sugar-farming industry into large scale production by plantings and a mill at Hambledon in 1882, 10 km south of Cairns harbour, in the area that is now suburban Edmonton. Timber harvesting was also underway, moving deeper into the ranges. This created a demand for improved transport facilities to the harbour. 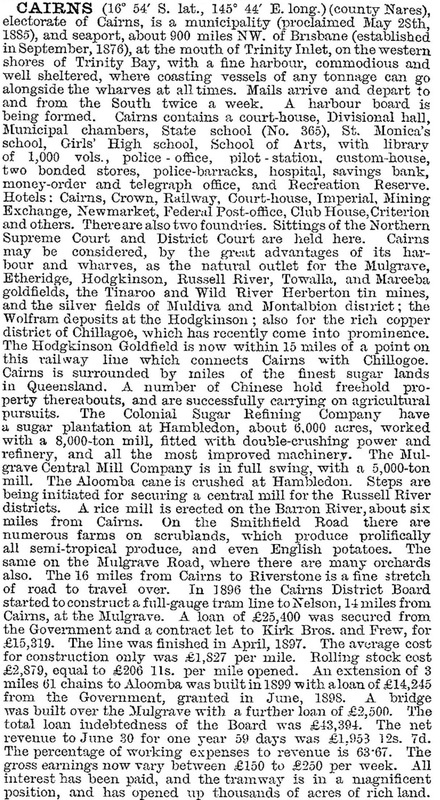 A railway from Cairns to Herberton was approved in 1884. Construction proceeded in stages, Kuranda (1891), Mareeba (1893) and Herberton (1910), which completed a line across the Atherton and Evelyn Tablelands. Total cargo was 51,888 tons (source: Ryle, pp 46-47). Cairns' municipal status was raised to a town in 1893 and a city in 1923. Hinterland soldier-settlement increased farm outputs in the 1920s and transport routes were improved: connection to southern railways came in 1924, and the Gillies Highway over the range to Atherton was opened in 1924. 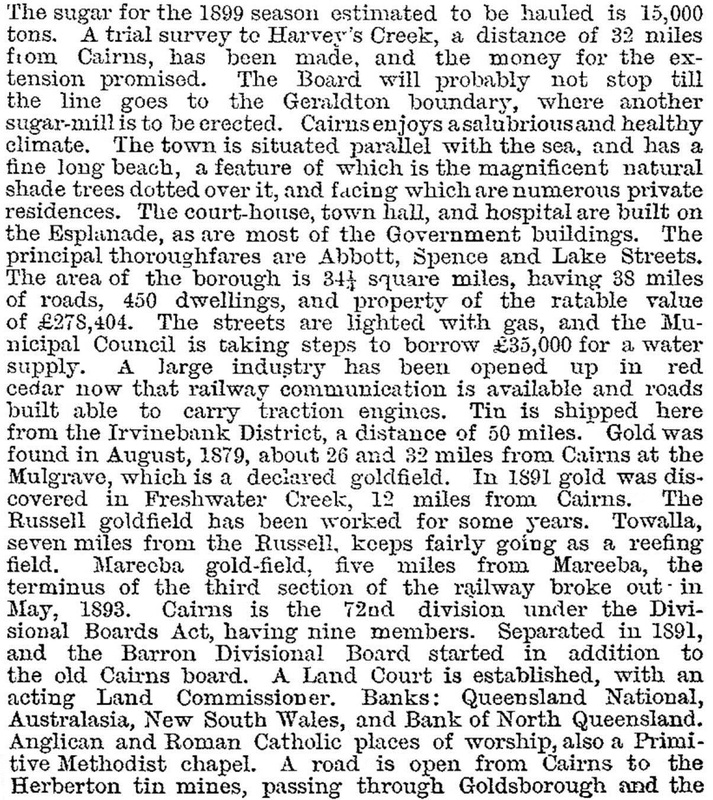 Cyclones had caused varying amounts of damage to Cairns in 1878, 1899, seven times between 1903 and 1920, and again in 1927. There had been a gradual change in building construction from timber to reinforced concrete or cavity brick, and a number of notable (heritage-listed) buildings were constructed early in the century and in the 1920s-30s. They include the school of arts (Lake Street), Mulgrave Shire offices (The Esplanade), Cairns City Council offices, the Court House and the Catholic convent, presbytery and high school (all in Abbott Street). The heritage-listed wharf area, dating from 1910, was an early work in reinforced concrete. By 1971 Cairns' population was nearly 33,000. A drive-in cinema opened in 1961 and parking meters were installed in the business area in 1965. The menace from stingers and jelly fish at the beach was reduced by the Tobruk memorial baths (1962) at North Cairns. Tourism changed from 'Sunlander' rail journeys to fly-in/fly-out excursions. United States service personnel, who remembered their Atherton Tableland days, returned in the 1970s to experience Barrier Reef, rainforest and resort stop-overs. Domestic tourism also grew, and the Cairns international airport opened in 1984, supplanting Townsville as the gateway for Japanese tourists. From 700 motel and hotel rooms in the 1960, Cairns had 6500 rooms in 1987. The Harbour Board had reclaimed mudflats and mangrove foreshores since the 1950s with hardly a murmur of opposition. But proposals to recover land off the Esplanade and to develop Admiralty Island in the Inlet were overturned by determined protest. The Marlin marina (1987) was followed by extensive refurbishment of the Esplanade foreshore during 2003-06 with a swimming lagoon, parkland and recreation facilities. By the 1980s Cairns had a metropolitan feel as shopping moved into the suburbs. A drive-in shopping centre was opened in Earlville (1980) and Smithfield (1986). Neglect of central city retailing was corrected by the opening of Cairns Central Shopping Centre in 1997, with over 180 outlets including a department store, discount department stores and supermarkets. Cairns Central is positioned four blocks away from the Abbott Street precinct, but it adjoins the main railway station and to that extent occupies a central location. Despite Cairns' sprawl over the hills and ranges, the central city has kept some prime functions. It has the base hospital, the convention centre (1997), and education complexes, including St Monica's in Abbott Street and St Joseph's/Augustine's (1927, 1930) in adjoining Parramatta Park, and Cairns High School (1924). The City Council outgrew their office space in Abbott Street and built a new civic centre in Portsmith in 1976. In 1995 the Council amalgamated with Mulgrave Shire, and in 2008 Cairns City was enlarged again by amalgamation with Douglas Shire to form Cairns Regional Council. On 30 January 2011 news came that a cyclone originating near Fiji was intensifying. By the next day the cyclone, named Yasi, was predicted to rise to Category 5 intensity, exceeding cyclones Tracy and Larry (1974, 2006). Cairns base hospital on the Esplanade and Cairns private hospital on Abbott Street were evacuated on 1 February, not a good omen if hospitals are needed in an emergency. Thousands of residents in low-lying areas also evacuated to avoid the expected storm surge associated with the cyclone. On 3 February 2011, the centre of the cyclone crossed the Queensland coast 150 km south of Cairns, sparing the city its worst ferocity. Fortunately the cyclone did not coincide with a high tide, although there was heavy rain and flash flooding. Winds gusted to 93 km/hour (Cardwell was 290 km/hour). The Sunlander train service (1953), that had made the 31-hour, 1681 km journey from Brisbane to Cairns three times a week, made it's last runs in December 2014 and january 2015, replaced by the Spirit of Queensland newer and faster fleet. Subsequent censuses included the northern beaches, 108,933 (1996, including tourists and visitors) or 133,199 (1996, for the whole municipality including former Mulgrave Shire and including tourists and visitors). In 2006, after deducting an estimate for tourists and visitors, the municipality's census population was 127,438.